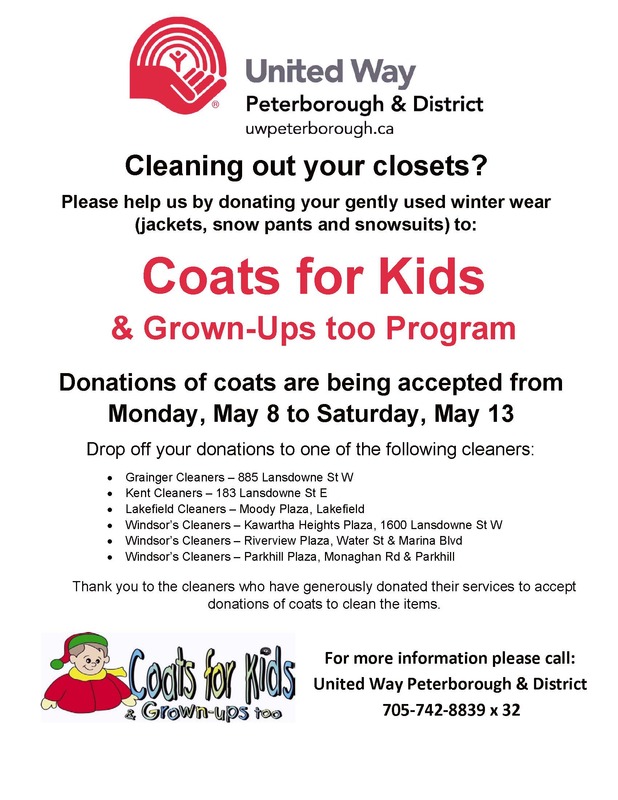 United Way of Peterborough & District’s Coats for Kids and Grown-Ups Too program strives to ensure that children and their families will be warm during the winter by providing clean, gently-used winter wear to children, youth, and adults in Peterborough City and County. 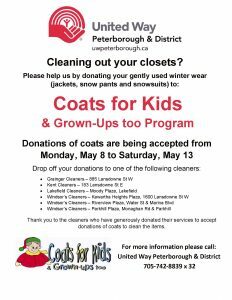 Coats for Kids is possible due to the generous support of Peterborough residents, community organizations, and program partners. Since 1986, individuals and families have donated gently worn winter wear which is then cleaned at no cost to the program by local dry cleaning providers. Grainger Cleaners, Kent Cleaners, Lakefield Cleaners, and Windsor’s Dry Cleaning Centre have been active and committed program partners since the program began 29 years ago. Other community partners such as Global Point Logistics and McWilliams Moving & Storage have ensured that cleaned coats can be stored. Click here for a printable flyer to share! 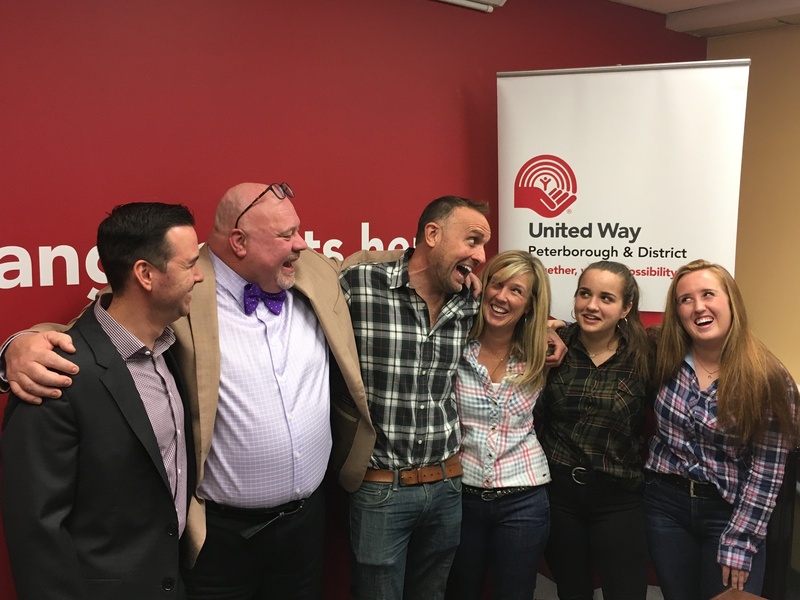 Jim Russell, CEO United Way Peterborough & District announced today at the United Way office on Stewart Street that local social media maverick and entrepreneur, Neil Morton would Chair the 2017 Community Campaign. Neil is the son of David Morton former head of Quaker in Peterborough. Having moved to Peterborough at a young age, Neil developed a profound love for the community. He attended Adam Scott and graduated from Trent with an honours degree in history and English. He moved to Toronto to study journalism at Ryerson University and for 18 years worked as Magazine/Digital editor for multiple publishing companies before returning to Peterborough with his family, as part of a lifestyle choice. Mr. Morton is Co-Founder of the digital media company PTBOCanada.com and Co-Founder of the boutique social advertising agency StudioPTBO.com. 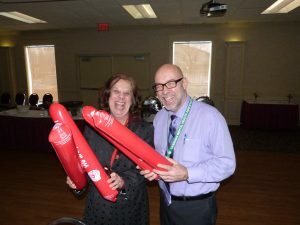 He sits on the board of the Peterborough Chamber, is an expert-in-residence on social media/branding at the Innovation Cluster, and is a Founding Member of the grassroots entrepreneurial organization Startup Peterborough (local chapter of Startup Canada). Morton does regular public speaking on branding, social media, marketing and positivity. Morton resides in Peterborough with his wife, Christi, and teenage daughters, Avery & Chloe. He loves Peterborough & plaid. Faith Dickinson, “Cuddles for Cancer” is 2017 Scholfield Award Recipient! 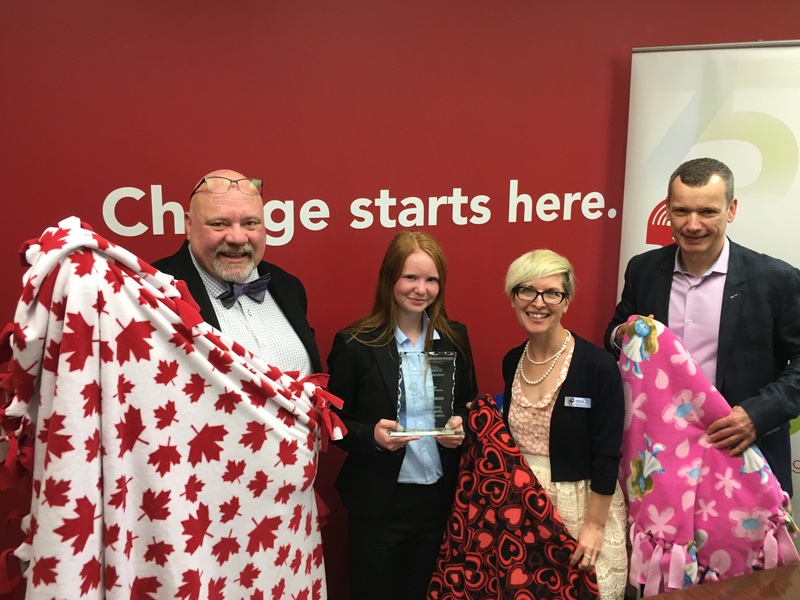 United Way of Peterborough and District today announced the 2017 recipient of the Scholfield Award of Community Distinction. The annual award was established to recognize an individual or organization for their outstanding contribution and ability to mobilize change within the community. Faith has also developed a signature Soldier blanket for men and women serving overseas or returning from service with PTSD. Her blankets are a global phenomenon having comforted Soldiers in Kuwait, Afghanistan, Poland, Iraq, and Ukraine. A reminder to those brave men and women of the respect and love that exists for them back home. Past award recipients have been Bill Strode, John Martyn, People First, Survivors Abreast, Marie Bongard, and Roy Brady and most recently Stephen Kylie. 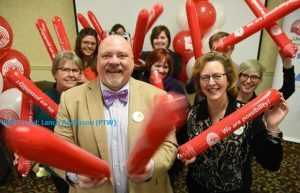 There was a celebratory tone today down at the water’s edge in the Holiday Inn as United Way Staff and volunteers reveled in the success of the 2016, 75th anniversary campaign results. Close to 100 people were in attendance to share in the celebration. Among those was Eileen Kimmett who shared with the room her particular enjoyment of participating in the Paint the Town Red event. Spending the day trying to eat at as many participating restaurants as possible with her children. She stated “it was fun but filling!” This continued a light hearted competition between her and friend Andy Sawada and his family to see who could get to the most restaurants at this annual event. Marion Burton President of the Peterborough and District Labour Council, brought greetings from organized labour and reminded people that the United Way is the charity of choice for organized labour across the country. Departing from tradition, the United Way revealed a Community Campaign Report Card, which graded different aspects of the campaign. “Volunteer Leadership”, “Community Spirt and Participation”, “Tenacity and Commitment”, all received an ”A”, with “Potential for Growth” being graded at an “A+”. This year’s 2016 Campaign raised $1.82 million, bringing the cumulative 75 year total to just over $73 million. The 2017 Campaign Chair has been selected and that community announcement will take place later in April.